My mouth is watering as I write this: I’m thinking of a medium-rare venison steak, its savory, red juices mingling with a full-bodied, jammy cabernet sauvignon wine on my palate. Few things in the world bring me more pleasure. And while I enjoy this combination just as much with beef, achieving perfect balance with my favorite wild game meats is always extra special. Venison applies to deer, elk or antelope in this story. And by testimonial from other hunters, I imagine moose will work with these wine suggestions, too. True, these meats have their own nuances, but I think tastes and textures are similar enough to pair them with the same wines. More importantly, the way in which the meat will be prepared is a better determination of wine selection. Before I go on, however, know that the perfect wine is relative. My preference for wine may not mirror yours. As a wine drinker, this is who I am: I buy most of my wine at the grocery store. I rarely spend more than $12 per bottle, but will buy as high $30 on special occasions. I prefer tannic and fruit-forward reds. And my loyalty remains with the wines of California, although I do enjoy wine from Washington, Oregon, Australia, France and Italy. Steak and wine is a classic partnership. When you’re eating a juicy, toothsome wild venison steak, pair it with a wine medium- to full-bodied and highlights dark fruit flavors that complement the meat’s redness. Which wine you choose, however, will depend on your palate. My favorite reds to serve with a venison steak are cabernet sauvignon, merlot, petite sirah, syrah, shiraz, zinfandel and petit verdot. The heavier body in these wines provide a velvety mouth feel while showcasing intense blackberry, black cherry, currant and/or blueberry flavors that complements venison’s wild taste. If you enjoy dry wine, go for the cabernet sauvignon, petite sirah or petit verdot. If you are looking for something softer and sweeter, merlot is your go-to. For a spicier, peppery wine, pick syrah, shiraz or zinfandel. And if you enjoy grilled and/or smoked meats (Who doesn’t?) try malbec from Argentina in addition to zinfandel or a fruity cabernet. 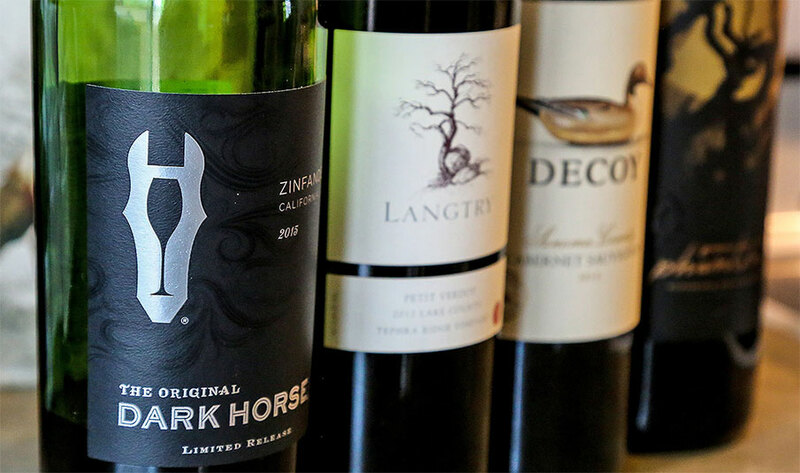 My favorites are Bogle Cabernet Sauvignon, 14 Hands Cabernet Sauvignon, Decoy Cabernet Sauvignon, Robert Mondavi Winery Cabernet Sauvignon, 14 Hands Merlot, Langtry Tephra Ridge petite sirah and petit verdot, Shannon Ridge Petite Sirah, Black Horse Zinfandel, and Gregory Graham Zinfandel. What you serve with your venison stew or braise will depend on how heavy or light the dish is. Oftentimes, the wine you drink at the table also is the same wine used in the dish for cooking. For example, you wouldn’t serve and cook with the same wine for a dark venison-neck stew as you would a delicate braise. There’s no reason why the wines paired with steak can’t work with hearty venison stew or roast venison dish with gravy. However, I do prefer something softer and lighter that won’t fight with the dish too much. In addition to petite sirah and merlot, I also enjoy pinot noir. Its higher acidity plays well with richer dishes. My favorites are A to Z Pinot Noir, Decoy Pinot Noir, Cotillion Pinot Noir, and Le Grand Noir Pinot Noir. The great thing about pinot noir is it pairs well with so many dishes. It’s light enough to serve with many fish and fowl meals, yet not so delicate that it can’t get along with red meat fairly well. If you’re going surf and turf, pinot noir is a good pick. In rare cases, for dishes such as venison osso buco, I use chardonnay – a dry white wine – to build the braising liquid, which is intended to be light and delicate. However, I’m not fond of chardonnay with tomato-based, acidic dishes. If you find yourself in this predicament, replace the cork on the chardonnay and stick it in the fridge; it’ll keep for sipping with cheese after the work the next day. Then open up something that you’d rather drink with the dinner. Still, this doesn’t mean whites are completely off limits with venison. Chardonnay and sauvignon blanc pair well with creamy dishes where venison shares the stage with other ingredients. Recipes such as venison stroganoff and venison-ricotta ravioli with brown butter will pair well with chardonnay’s lemon and apple flavors, while Mediterranean, Middle Eastern, and Asian recipes and those with pumpkin or squash are delicious with sauvignon blanc’s more savory profile. My favorites are Chateau Ste. Michelle Chardonnay, Sterling Vineyards Oak Knoll Chardonnay, Bogle Chardonnay, and Gregory Graham Sauvignon Blanc. Venison is delicious with pasta. Whether made into meatballs or used in a Bolognese sauce, I usually like to mix ground venison with 20 percent pork shoulder. The pork incorporates fat into the lean game, adding more flavor and richness. Then simply served with pasta, good marinara sauce and topped with salty Parmigiano-Reggiano cheese, you have a delicious and classic dinner; one that pairs well with the same wines you would drink with pasta and beef. Tart, medium-bodied wines work well here, such as iconic chianti (sangiovese) or zinfandel. If you feel like drinking wine with a venison burger, that is perfectly acceptable, especially if you like to prepare your burgers medium, medium rare or rare. Still, I don’t want to pick a wine that will overwhelm the burger and its fixings. As mentioned before, pinot noir is a great all-around wine and it will complement the slight gaminess in venison burgers beautifully. Merlot also is nice choice. But do not overlook blends. Just because a wine is a blend (made with several different types of grapes) doesn’t mean it can’t be as delicious as a varietal (made with one type of grape). While usually less expensive than varietals, discovering a solid red blend almost makes me forget everything else. Some of my favorite wines are blends; I serve them with everything from steaks to burgers to pasta. My favorites are Bogle Phantom, Bogle Essential Red Wine, 19 Crimes, Cupcake Red Velvet and 14 Hands Hot to Trot. If you’re an experienced wine drinker, you may have found this story dreadfully dull. I apologize. But for those less experienced, I can offer some advice: At the end of the day, drink what you enjoy, but don’t be afraid to try something new. Life is too short. So don’t spend all of it drinking dessert wine. As you experience more wine, your palate will change. Even if you didn’t like something in the past, come back to it. What you found bitter five years ago might now become a no brainer. It’s almost like a light bulb that just turns on. I can remember a time when I only wanted to drink whites. Now, I hardly ever buy whites. Once you’re able to develop your palate, you will learn to taste and appreciate the balance and marriage of different flavors to complement your meal. You will learn to tell the difference between good wine and bad wine. It’s such a fun process. So if you enjoy good food and cooking, it’s time to step up your wine-drinking game.